Christmas art market by Ikuinen Gallery! 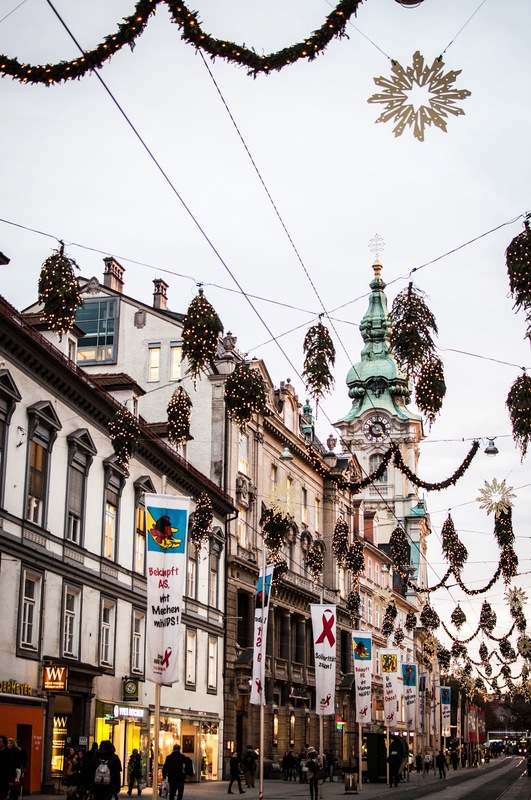 Graz is the 2nd biggest city in Austria and each year the place for the European Youth Award. This year the 12IMPs were able to explore the amazing city, incredible projects, great work shops, a wonderful EYA gala and the Austrian spirit. Three students now reviewing the last few exciting days. Moon : From Tampere to Helsinki and via Frankfurt to Graz. Oh my god, I was extremely feeling tired after long hours of trip to Graz. However, seeing beautiful city Graz totally refreshed my condition. After city tour under the lead of our captain Cai, Graz became one of the city that I would remember for long time. 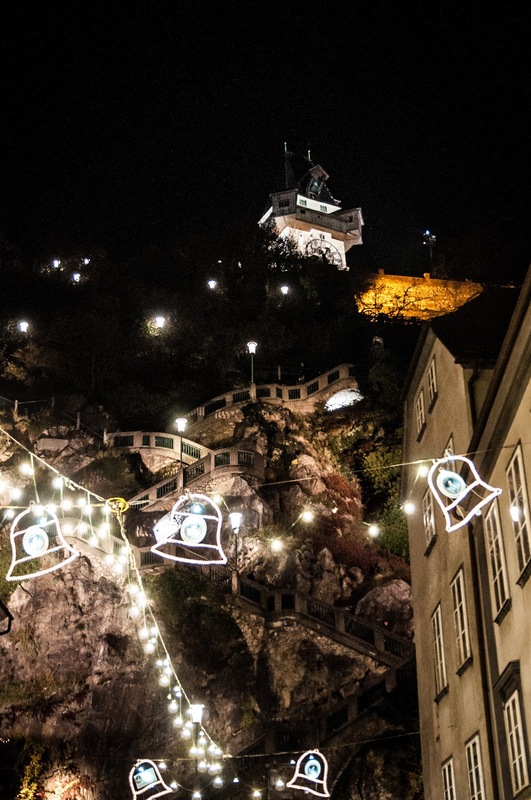 Carolin : Especially with all the Christmas Lights Graz presented itself from its best side. Even if we were landed a few hours ago Cai showed us the most important places like Hauptplatz, the town hall or an incredible view to the Schlossberg. Krista : Later on we found a way to a restaurant with traditional Styrian food, and schnitzel! Next to it was located Helsinki Radio, Graz seems to have a tendency to have random finnish words scattered all around it. Moon : FH Joanneum was indeed very inspiring school as Cai mentioned. Even though there was some problem of organizing the school tour, it was enough to get general atmosphere of our possible partner university. Krista : In the morning we made a visit to FH Joanneum, Unfortunately all the newest technology was hidden behind closed doors. But at least they had a jet in their backyard, how cool is that? Later on we tried out another traditional food, spätzle! Carolin : After that we got a super great city tour where the guide showed us the most important places in Graz. It is awesome how many hidden places a city can have. We saw the Mausoleum or the bakery where emperor Franz ordered all his food centuries ago when he visited Graz. Moon : I am pretty sure that it is not only me who totally inspired by Paul Hughes. The workshop session that I attended, The three stages of transformation, had really unique presentation style. While telling the story, Paul Hughes drew image and wrote sentence, which are perfectly complementing and clarifying his concept. In the end of story, length of a one long continuous paper he had draw and wrote on, reached ten meters. (He also had keynote speech 'Ten Meters of Thinking - The Circle of Innovation') His unique way of presentation impressed me a lot, however, I must say that it wasn't just eye-candy presentation. Insightful thought he shared to us, was what truly inspired me. Paul Hughes’ presentation captivated an audience completely. Presentations of Winning projects of EYA 2013 in the evening, which was highlight of this whole event in my opinion, was series of intensive and energetic pitches. After 7 to 10 minutes of presentation, juries asked sharp question to presenters and presenters answered back smartly. It was difficult for me to imagine which project would be selected as the best since every project was stand on its priceless mission and executed wonderfully. Carolin : I went to visit the workshop of Niki Ernst. He gave a lot of great advices how to hold a great pitching session. His workshop was inspiring and well done - even if it was, in my opinion, a bit too short! Krista : I enjoyed listening to the ideology that Paul Hughes shared with us, “Design Imperfection” (but keep it functional). I love the idea of designing and creating things that are not polished to their very end, something that feels warm and natural. After the workshops there was bit of free time for a walk around the city center, spotting some Finnish design and a having sip of glühwein. Krista : Before continuing with the festival I took a tour with couple other students in two museums. After accidentally stumbling through a shoe exhibition we took a look a variety of armor, weapons and high-class vanity items. The armory holds over 30 000 pieces of equipment. Gorgeously crafted armors, beautiful pistols and guns taller than 2 meters! It’s a shame you’re not allowed to try those on. Moon : Exhibition of student project from Finland, Denmark, Spain and Austria was held. FOE, MINDTrek OFF and MindTrek Lumia 1020 were presented by TAMK media students. Also, posters that give feedback to winning projects were prepared by students. In the evening, a project 'Our Right' was announced as the best project by juries during Gala Ceremony. Also, 'Call for Books' had honour of becoming the best project by audiences voting. Carolin : In the exhibition we were able to give our feedback to the winner projects as well as present the TAMK projects to the visitor. It was nice to see that many people were interested in what we are doing and the winners were glad as well as thankful to hear our opinions. The evening gala went pretty well and even the most of us had to skip the after party (because of the unbelievable high price!) we had a nice time at the EYA 2013! Tampere, we are coming back! Krista : After learning it’s not a good idea to do anything on the day of departure, we took off to the airport and started our journey back to our lovely Finland. Moon : Again, our way back to Tampere wasn't easy at all. In addition to delayed flight, we experienced severe turbulence, which was strong enough to make all of us quite nervous, before landing to Helsinki airport. All in all, it was extremely exciting field trip until the very end.